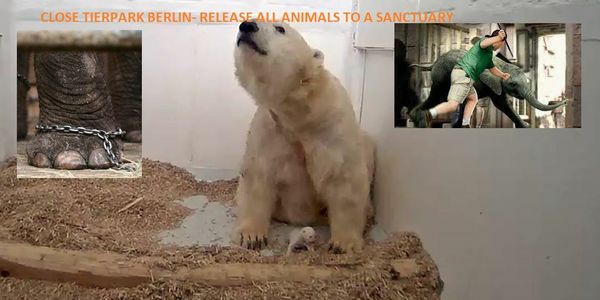 Petition: Another Polar Bear Died -Close Tierpark Berlin-Release all Animals to a Sanctuary! Another Polar Bear Died -Close Tierpark Berlin-Release all Animals to a Sanctuary! Berlin's Tierpark says a baby polar bear has died after 26 days, less than a year after its mother lost another cub. The Tierpark said the cub, which hadn't been named, appeared healthy on Monday but zookeepers found it dead when they checked a surveillance camera on Tuesday January 2, 2018 . It said that an autopsy is being carried out on the cub, which was 26 days old. Tonja's first cub, Fritz, died of unknown causes in March at the age of four months. Peta refunded charge2008 against the former Berlin animal park manager Dr. Bernhard Blaszkiewitz. To him it is accused of being responsible possibly for the homicide without reasonable reason of more than 150 animals. The zoo and animal park manager had admitted some weeks ago publicly having turned 1992 cats the „neck in the year". From an internal paper further it arises that on his „instruction, young cats been killed" should be. In the charge of the animal right organisation it is among other things about deaths of Kängurus, monkeys, bears, tigers and lions. How many kittens still have to die until the zoos realize that this breed is a wrong track? Tierpark Berlin only cares about money, and is not interested how the polar bear mom feels. You can help: Dont visit Tierpark Berlin or another Zoo. The animal right organisation PETA of Germany inc. has 2008 refunded charge against the former Berlin animal park manager Dr. Bernhard Blaszkiewitz. To him it is accused of being responsible possibly for the homicide without reasonable reason of more than 150 animals. The zoo and animal park manager had admitted some weeks ago publicly having turned 1992 cats the „neck in the year". From an internal paper further it arises that on his „instruction, young cats been killed" should be. Now Germany PETA inc. wants to check other possibly criminal-relevant offences. „The as can be proved homicide not appropriate for protection of animals of the cat's babies possibly is only the beginning. ", according to Frank Albrecht von PETA Germany inc. „We have tips that other animals have been killed in the Berlin zoo under dubious circumstances. According to our opinion this man is portable as a zoo manager no longer." In the charge of the animal right organisation it is among other things about deaths of Kängurus, monkeys, bears, tigers and lions. Furthermore the animal right organisation wants to check the export of two, in the 3/1/2001 in the animal park Berlin to born Siberian tigers to China of the public prosecutor's office. According to in the annual report 2002 of the Berlin zoo these tigers about the animal trader Werner Bode should have been exported to the Chinese tiger's farm in Hengdaohezi. thank you for 204 087 Signatures. I deliver the Petition now to Tierpark Berlin, sending a Copy to WAZA and EAZA. Thank you so much for your Support! Tierpark Berlin’s baby polar bear died in the early hours of the morning on 2 January. An autopsy has been carried out at the Leibniz Institute for Zoo and Wildlife Research (IZW). Please share the Petition! Thank you! Update :about polar bear baby died after 26 days: The autopsy proved that the boy had drunk not enough. It has got during from 12 to 15 hours not enough milk said animal park manager Andreas Knieriem. Already 158914 people signed the petition! Please continue your support and share the petition! 236 337 people signed-wow-thank you so much. Tierpark Berlin has had to put its female manatee to sleep. Please continue your support and share the Petition to close Tierpark Berlin and release all captive animals to a Sanctuary.